Weekend Winos | Enthusiasts in search of quality libations to enhance weekends. Wine in a Can – Why Not? It’s Good Wine! Wine in a box, wine in a glass, wine in a keg, wine in a can. Why not? It is readily available. Trader Joe’s, BevMo, the local grocery store, 7 Eleven, and the local drug store all have some selection of wine in a can right next to the wine in a box. Some, have it refrigerated and ready to go at the end of the craft beer section. The prices vary, some are expensive, but you can not beat the convenience. And, it is not the sweet, inexpensive wine that you expect from a boxed wine (sorry Maggie Griffin). Many of the wines we tasted were good, and all agreed very refreshing. Many compared the experience of drinking wine in a can to drinking a beer at an outdoor party or sporting event. I believe that the reason for packaging wine in a bottle is to ensure it ages properly. Most of the winos in our group have rarely kept a bottle for more than a year. I think we are probably in the majority of casual drinkers. Personally, I like drinking from a bottle (water, beer, juice) so the Bon Affair packaging appealed to me and the wine was quite good. I also like that the can stays cooler and is “cooler” than the small box wines or even the single-serve wines in a plastic glass. I still can not figure out why Sofia comes with a straw? Before the weather gets too cold (it is still in the 90s in CA right now), I’m sure we’ll gather to do some more “research”- maybe wine in a keg is next. Out with the old and in with the new! We’ve been going to this event on Saturday since 2009. Last wrote about it in 2014. We started to notice a different flow to the crowd last year. This year, for sure, it was a different event. There were fewer wineries and brewers, lots more high-end jewelry vendors, the cooking demo at noon was The Mountain Kid’s cook-off finals, the Japanese restaurant did not have tables outside, and there were a lot less of our 4-legged friends. Stella where art thou Stella?!? We missed our favorite brewery, usually they would have at least 2 stands at the event, and we always tasted some new flavor. The flip side is that we had the opportunity to taste new beers and more wine. Also missing were the winery region exhibits (usually 3 or 4 in the seating areas around the ice rink). The flip side is that we had places to sit, on an especially hot day, to enjoy the wineries and breweries that were there on Saturday: Boeger Winery, Blue Frog Brewing Company, Bonterra Organic Vineyards, Coryelle Fields Vineyard, Gekkeikan Sake, MacLeod Family Vineyard, Mount Aukum Winery, Nick’s Cove, Sierra Vintners, Silkwood Wines, Skinner Vineyards Winery, Archer Brewery, Tin Barn Vinyards, and VGS Chateau Potelle. We had a chance to talk to almost every vendor. Some of the standouts included the 2013 Zinfandel from VGS Chateau Potelle (we bought a bottle), the IPA from DNA Brewing and JOON a Rose Syrah from Coryelle Fields Vineyard. We’ll take a close look at the program next year; maybe we need to break our pattern and try a Sunday instead of Saturday for the 2017 Food and Wine Festival at Northstar. Categories: Events, Libations, Wine | Permalink. We last attended on August 2013, when the event was still called SF Chefs and it was under a big white tent in Union Square. We wrote about it: Party in Your Mouth! SF Chefs 2013 Grand Tasting Tent. This year we gathered for the Saturday Evening Grand Tasting at Eat Drink SF, which is now held at Fort Mason (we love this waterfront location with gorgeous views). We splurged on the VIP tickets; it was expensive but well worth it. Access to the event 45 minutes early made a huge difference, and the VIP lounge was OK (they needed lots more seating and in my opinion, a more relaxing/spa-like vibe so you could regroup and venture out again, instead of more food and wine booths). Still, well worth it! It is an impressive event where you can enjoy tastings of wine, beer, liquor and more than 35 of the Bay Area’s top restaurants. Yes you can go back for seconds! Since it is all under one roof now, there are chefs & bartenders that do demonstrations on the main stage and an area for the San Francisco Wine School Beverage Classroom. Since we were able to enter the event 45 minutes early, it does get very crowded later in the evening, it gave us a great opportunity to get a quick overview, speak with some of the Chefs as they were doing their last minute prep. We identified libations and restaurants that we knew and wanted to taste and others that we had never heard of and caught our eye. Who knew that Ca’Momi had restaurants or that Fogo de Chao just opened in SF? Both served delicious bites. It can be overwhelming – there is ice cream and pastries (some like to start with that) foie gras, delicate bites, braised pork, delicious broths, Serrano ham, Mezzeta olives, olive oil, burgers and lots of different wines, beers, port, liquor and even Pure Leaf Tea and Pellegrio Sparkling water. We also noticed lots of “photo booths” this year from Beaujolais Wines, Taiwan Tourism Brewery dumplings and Celebrity Cruises. We divided to conquer, and although there was no possible way we could taste everything, there were some clear standouts that the group agreed on. Our Go-to Beer = Stella Artois, they were also pouring Cidre. I think they have been at this event every year and they are very generous with their beautiful Stella Chalice glasses (I think you can take them with you, we did) and a full pour. Also at the event was Trumer Pils and the San Francisco Brewers Guild Craft Beer bar with 5 different brewers. Best Bite = Parallel37, Michael Rotondo, none of us had actually been to this restaurant at The Ritz-Carlton in SF, it is now at the top of our list to visit. I am sure the Chef would describe it better, but it was a delicious broth poured, as we approached, over the noodles and garnish. It was delicate and robust at the same time. Just delicious! Touching Moment = J.Lohr Carol’s Vineyard, in all the craziness of the event, we tasted a delicious Cabernet Sauvignon, and enjoyed meeting Carol Lohr’s daughter who told us about her mother and how they donate $2 for every bottle purchased of the Carol’s Vineyard Cab and Sauv Blanc to the National Beast Cancer Foundation. We bike to their tasting room in San Jose, so will have to keep that in mind next time we visit! Amazing Pastries = Cafe Madeleine, out of this world! The biggest compliment I can think of is that around 9:30 pm there were LOTS of Chefs in white jackets who had left their stations and were tasting these beautiful and delicious pastries. We chose chocolate and caramel and that was our last bite of the evening. What a nice surprise! We had planned a fun brunch with winos from Alameda to explore the island. As the sun started to set, we found ourselves drinking wine with a fabulous view of the SF skyline from the former Naval Air Station on Alameda Point. After 4 hours, we were still laughing and relaxed – it felt as if we were on vacation. But…I am getting ahead of myself. At first, the huge hangars and old buildings made us wonder what we had gotten ourselves into, then we started seeing names we recognized – Hangar 1 Vodka, Rock Wall Wine Company, Faction Brewing, St. George Spirits, and Building 43 Winery. We were determined to visit all of them. Well, that was the plan. The reality is that we started at Rock Wall Wine Company and that is where we stayed. The tasting experience was excellent (5 tastes from an extensive selection + and extra bubbly to start) and you can buy wines by the glass so everyone can have exactly what they want. That is enough of a good start, but combined with the delicious food from Scolari’s, the comfortable seating area (some of it reserved for adults only), the SF city skyline view and great conversation and laughs with our group – it was spectacular. Did I mention that each person could buy wine by the glass (in hindsight we should have just opened a few bottles) so everyone could drink exactly what they wanted. During the week, they even have Happy Hour with a 50% discount on select glasses of wine. There were many medals displayed, no doubt a result of the skill of Winemaker Shauna Rosenblum. But over the course of 4 hours of fun and relaxation – we were determined to judge for ourselves, and we did! Some of the standouts came home with us: 2013 Tannat “The Palindrome”, 2015 Sparkling Grenache Rose , 2014 Chardonnay from Sonoma,2012 Le Mur de Roche ( a special treat) and 2015 Zin Nymph. We will definitely be back to create new experiences at the other tasting rooms we did not get to this time. Categories: Champagne, Food, Travel, Wine | Tags: Almeda, Building 43 Winery, Champagne, Chardonnay, Faction Brewing, Hangar 1 Vodka, Rock Wall Wine Company, Scolari's at The Point, Shauna Rosenblum, St.George Spirits, wine, Wine tasting, zinfandel | Permalink. Stroll The Alameda Part Deux: New Finds! This year, our second time attending, we had no trouble convincing the winos to join us for a fun afternoon of wine & beer tastings as we visited the merchants on The Alameda. Much like last year, we met early and endeavored to visit all the locales. 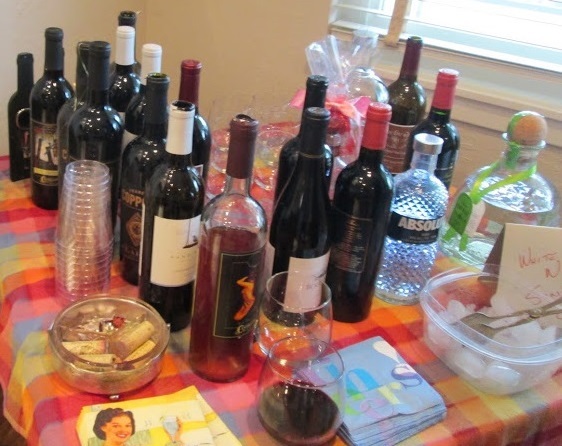 This is the sixth year that the Shasta / Hanchett Park Neighborhood Association and the Alameda Business Association organize The Alameda Wine & Beer Stroll. Armed with our wine or beer glasses and official yellow wristband we were off. We recognized some of the participants from last year: Travieso Winery (should have been back at the tattoo parlor), Santa Clara Valley Brewing, Coterie Winery and The Wine Affair. There were some new participants that made our day! Umunhum Brewing: Great Beer! They say it is California’s first co-op brewery, a growing group of dedicated members who are passionate about great beer, customer service, sustainability, and great food (supporting local and organic farms where possible). We were so impressed by the beer, we joined the co-op! Sangria at Zona Rosa: The sangria was very good and at this half-way point we also sat down to enjoy their decadent guacamole (yes, that is bacon and nuts) and home-made chips. We agreed that we would be back soon to the restaurant to try other items on their menu. It is a small place and always packed. Everyone there recommended we make reservations and insisted that we would not be disappointed with the meal. Like we said last year…This is an event that we will add to our regular list. Already looking forward to the 2017 Stroll, and in the meantime we will be back to enjoy the new acquaintances we made. Categories: Events, Food, Libations, Wine | Tags: beer, Cabernet Sauvignon, Chardonnay, Pinot Noir, sangria, Stroll The Alameda, Unumhum Brewing, wine, Wine tasting, zinfandel, Zona Rosa | Permalink. The winos met in Tahoe for a long relaxing weekend at the lake. But no trip to North Shore Tahoe is complete without a stop in Truckee. We stop there every time, usually when we first arrive, for a nice relaxing lunch and libations before heading down to this lake. This time we ventured one block north of Donner Pass Rd, the main street, and stumbled upon some delightful new finds. After a quick stop at the Coffeebar Truckee we spotted The Pour House Wine Shop & Tasting , yes still on Jibboom Street! What a cool little place. The selection of wines from around the world is impressive, but the cheese and charcuterie options are also something to take a close look at. This is the perfect place to stop, taste some wines and then pick up a full basket of goodies for a picnic by the Truckee River or down by the lake. Yes you can pick up some box wine if you prefer. The group gathered for a house-warming party and what a treat to be part of it! It was a large crowd and everyone had a great time. 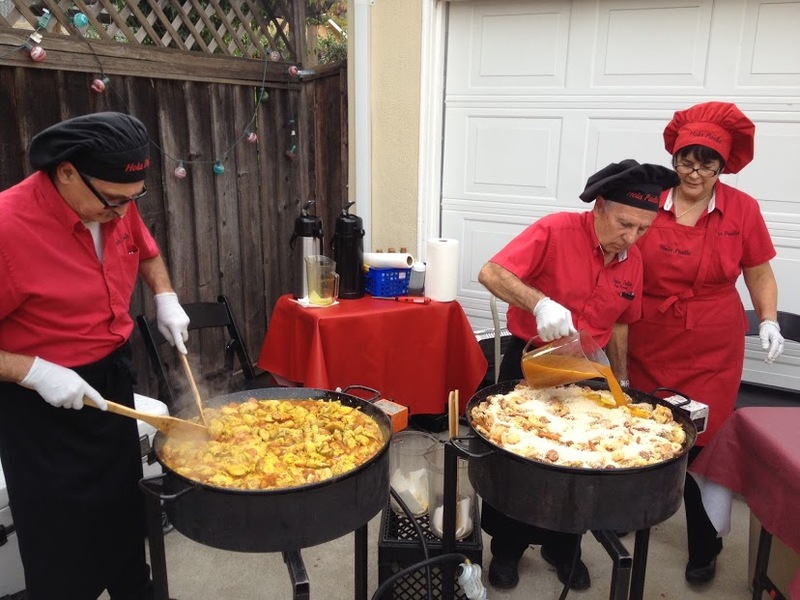 The hosts hired Hola Paella to provide the delicious food and a fantstic show. They cooked the paella as we all watched. Step-by-step they showed us how its done and our appetite just kept growing and growing. Gratefully the delicious appetizers (Serrano ham and melon mini-skewer; Manchego cheese, Spanish chorizo and Spanish olive stuffed with pimiento in a toothpick; and vegetarian empanaditas) were being served with wine, beer and sangria while we watched. 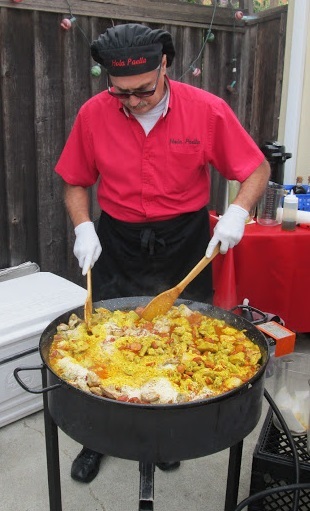 Making paella is an art form, and Chef Fernando and Team at Hola Paella sure have the experience and love that it takes to make this tasty dish. The Paella Valenciana is my favorite with all the seafood (mussels, clams, calamari, scallops, peeled and devained shrimp), chicken, Spanish chorizo, pork sausage, timely prepared with rice and vegetables (sweet peas, green beans, garlic, onions, roasted peppers, Spanish saffron and spices. 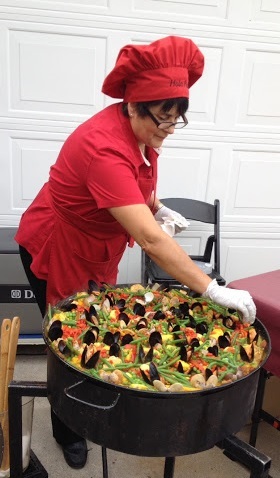 They also prepared, for any guests with allergies, an All Meat Paella with rice, boneless chicken, Spanish chorizo, pork sausage and green and red roasted peppers, green beans, sweet peas, garlic, onions, Spanish saffron and spices. Both were served with a house salad (Mixed organic baby greens, red peppers, & walnuts served with honey Dijon vinaigrette dressing) & a French Baguette with Butter. 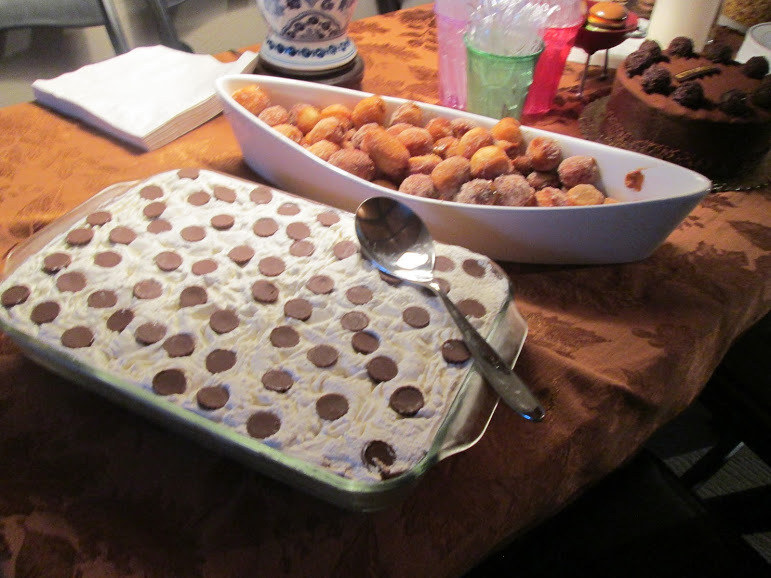 We all chipped in on the drinks and desserts and I assure you nobody left hungry. The small donuts with dulce de leche filling were the first to disappear. The peanut butter pie with whipped cream was a close second. Many guests asked to take some of the peanut butter pie home, because they heard it was good but had not had a chance to taste it. I should have thought of that! I must confess I did not pay much attention to the libations, my glass was always full with something special that one of the weekend winos had brought to share. I do know that I started with a delicious home made Sangria — must get the recipe. Categories: Events, Food, Libations, Wine | Tags: Argentine Wine, beer, Cabernet Sauvignon, Champagne, Chardonnay, paella, Pinot Noir, sangria, Spain, wine | Permalink.